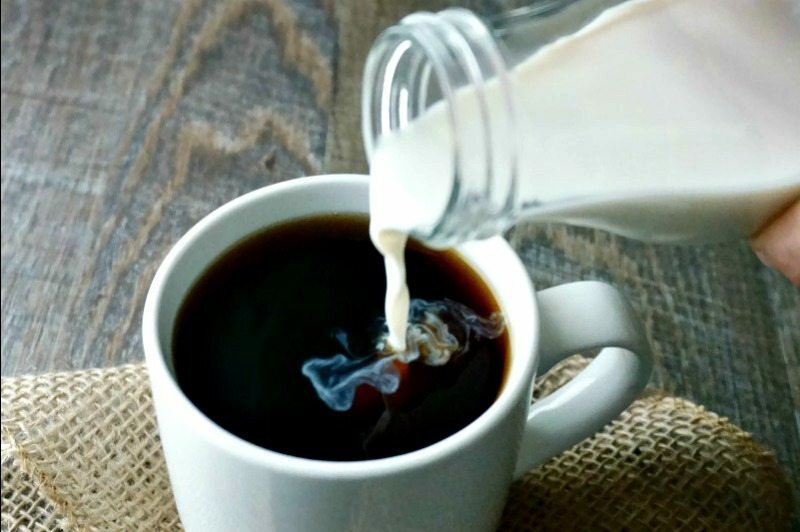 Coconut Vanilla Coffee Creamer: Forget ever having to buy coffee creamer again. 3 ingredients come together to create a rich creamer that is just the right amount of sweet for your morning coffee. Paleo. Gluten-Free. Vegan. My morning does not go well without it. I have given up caffeine many times over the years for various reasons, but looking back at those times, I missed my beloved beverage. And let’s not even talk about how off I was during my caffeine withdrawals. So now, I am back on the coffee train, with NO desire to ever jump off again. However, I have felt a bit deprived when it comes to coffee over the years. All those crazy good creamers that are on the market, are just not for me. They make me feel sick to my stomach and leave a bit of a fake flavor in my mouth. I have grown to enjoy drinking my coffee black or with a bit of milk splashed in it. But for a special treat, I use my homemade coffee creamer. With only 3 ingredients and a quick shake, I have a vegan creamer that is rich, velvety, and full of vanilla and coconut flavors with a note of maple in the background. It is the perfect way to indulge without indulging at all. 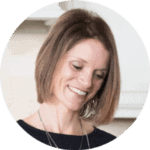 I love to pair my latte with my Dairy-Free, Gluten-Free Cinnamon Streusel Muffins or a Peanut Butter and Jelly Muffin for a perfect breakfast treat. This little afternoon treat called for my feet to be up and let myself enjoy each sip of rich coffee that was swimming with bursts of coconut and vanilla flavor. A little sip of heaven. A sip you can indulge in daily with just 3 simple ingredients and one simple step! You can not beat that! Coconut Vanilla Coffee Creamer can be stored in the refrigerator for 10-14 days. Be sure to give a good shake before using, because coconut milk is so thick it needs to be shaken well to distribute properly. 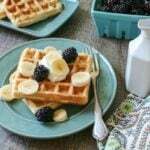 You may even want to put your ingredients into a blender to blend well to help emulsify the creamer. Be sure to use canned coconut milk, not coconut cream for this vegan coffee creamer. My favorite is Trader Joe’s Coconut Milk–it is thicker than most light brands, but does not separate as much as full fat coconut milk. Feel free to use any brand of light coconut milk or full fat coconut milk you like. 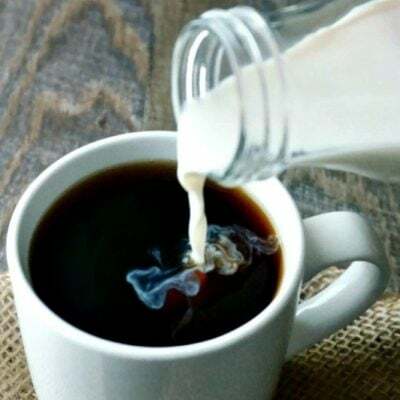 If you are looking to make a dairy version of homemade Vanilla Coffee Creamer, use Half-N-Half in place of the coconut milk. This creamer is great if you want to add a teaspoon of cinnamon or ground nutmeg to it as well. 3 ingredients come together to create a rich creamer that is just the right amount of sweet for your morning coffee. Paleo. Vegan. Place all ingredients in a large sealable jar and seal. Shake well for 2-3 minutes, until all indredients are well distributed. Store in the refrigerator. Use amount desired. 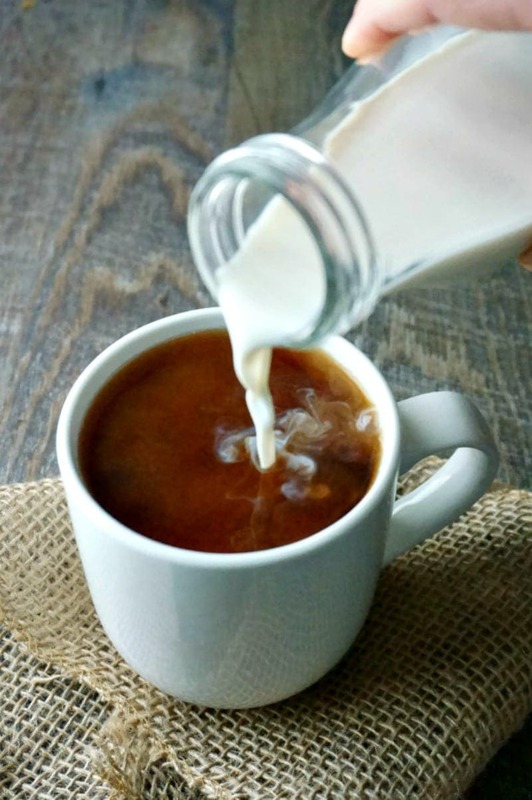 Be sure to use canned coconut milk, not coconut cream for this vegan coffee creamer. My favorite is Trader Joe's Coconut Milk--it is thicker than most light brands, but does not separate as much as full fat coconut milk. Feel free to use any brand of light coconut milk or full fat coconut milk you like. Great creamer and such a treat, Kristen. Love that it’s all natural. We’re using coconut milk for a lot of things in our house these days. Thanks Allie. I love how versatile coconut milk can be! Does it need to be refrigerated and how long does it stay fresh? Also, if refrigerated doesn’t coconut milk get hard? Coconut milk does get a bit hard in the can, but I think you are thinking of coconut oil, which when cold, becomes solid. Give this a good shake before using (as you should with any flavored creamer) and it will be perfect. NOM!!! And I would totally use Walden Farms Syrup in this because I won’t lie to you, I LIKE IT! ha ha! This is exactly what I use for creamer too!! It is so much healthier AND cheaper than creamer. Perfect! I’ve never really got in to creamers (not really a British thing) but this combination sounds delicious, as well as easy, so I could definitely be tempted. And pretty healthy too – love it. You may really love this! I hope you try it! I love coconut milk and use it whenever I can! Great recipe! This will be perfect for my afternoon iced coffee. It’s finally getting warmer and I crave a creamy, iced coffee ….simple, healthy and delicious! Do you have a brand of coconut milk that you like? I really want to start making this. You will love it! As far as coconut milk goes, ALDI just came out with a canned version that I like, as well as the Coconut Milk from Trader Joes. I prefer canned because it is cleaner than the refrigerated brands that have stabalizers in them typically. Thanks! So Aldi has a coconut milk all the time? I’m there about 3 times a week so I should be able to find it. I have some Trader Joe’s so I’m going to make some today. Yea. I hope you love it so much! I would never have thought to use canned coconut milk to make coffee creamer, what a great idea, it sounds delicious! Thanks Joy! Glad I could inspire you! I love the ingredients in this! I’ll have to try it out! I hope you do Marshie! This sounds perfect! I can’t wait to try it! This sounds great. I love that it’s not full of all those yucky ingredients that are in most store bought creamers. I must try it! I hope you do Allison–so much better tasting too! I absolutely love coconut so this sounds delightful, thanks for sharing this found you at Saucy Saturday! Enjoy… This is perfect for coconut lovers. I finally made this, and for some reason the consistency is not what I expected. It’s not smooth at all. But it’s ok. I’ll keep it. Melody, I am SO sorry the consistency was off for you. Did you shake up your coconut milk well? Did you use coconut cream instead of coconut milk? I used light canned coconut milk. You can try putting in blender and blending before storing in the fridge. Sorry my friend! Just a note I used a blender and it all separated! So I will retry it without using the blender. Can’t wait to see what it tastes like! Sorry that happened Trisha. I keep mine in a glass jar in the fridge and shake up each time before using. I have never had any issues. Mine separate as well and I warmed it on the stove and it combined! Thanks for sharing! Depending on the fat in your coconut milk and temperature of fridge, separation can happen. Great tip. Awesome combo! Definitely going to have to try it! Do you know what the calories, fat and sugars would be per serving by chance? I’d love to know! Love coconut! Thanks for sharing! Cristina, the nutritional values will be dependent on what coconut milk you use. You can enter in name brand ingredients onto myfitnesspal to get an accurate count. Because canned coconut milk is high in fat, it can go rancid quickly. Your nose will tell you but I mine is always good for 2-3 weeks! This creamer is out of this world delicious, inammwondering if it is 21 day fix approved?? This creamer for sure will help me quit my addiction to French vanilla coffee creamer but can I use it while on the 21 day fix?? Thanks you! I am not a 21 day Fix expert, but according to my research, the coconut milk and vanilla extract are both approved. It looks like NO sugars. However, this is much better than Vanilla Coffee Creamer. Maybe cut the maple syrup in half and add a splash more vanilla and just use a tad for coffee. Then you would have very, very little actual sugar. HA!HA! Well welcome to the party! I made this last night and in the morning (despite much shaking last night and today), my creamer did not look like the picture at all :(. There was a lot of stuff on the side of the glass jar and the contents continue to separate. Also, I didn’t taste much in my coffee, I put 3 tablespoons and normally I am a 1 tablespoon of creamer kind of gal. Not sure what I did wrong? The coconut milk was super solid when I got it. Should I try and different brand or type? Would like to try this again. This is so amazing! I used swerve and heated it on the stove for a few minutes it came out so creamy and yummy. Thank you for the recipe it’s much healthier than the nondairy creamer I was using. Yay!! So glad you enjoy! What brand of Coconut Milk do you use? I’d like to use the same because the only one I could find (something at Target, it was literally the only canned coconut milk they carried) did not exactly work out well with the recipe. It tasted AMAZING but the consistency left something to be desired. Yours looks a little creamer and less thick than mine turned out. Overall though I LOVE this recipe! It’s way better than any of the coconut creamers you can buy at the store. Hey Jessica! I am sorry this was not the best consitency for you. I use light coconut milk from Trader Joes. Their brand seems to be able to shake up perfectly and is not too thick. Try to look for a light version of canned coconut milk that dosen’t have many additives. Hope this helps! I just made this and added a healthy dose of fresh-ground cardamom and SERIOUS WOW. I may never buy a latte again. SO DELICIOUS. Thank you!!! WAHOO!!! That makes me so happy! And I have to try it with added cardamom–great idea Melody! Hi Kristen, I am trying to cut out plastic bags in our home. Would this work the same by maybe blending it for a few minutes? You can disregard that question:) I was looking at the wrong site! Oh Charlotte, this makes me so happy! I have been there in the middle of a move when COFFEE is a must. 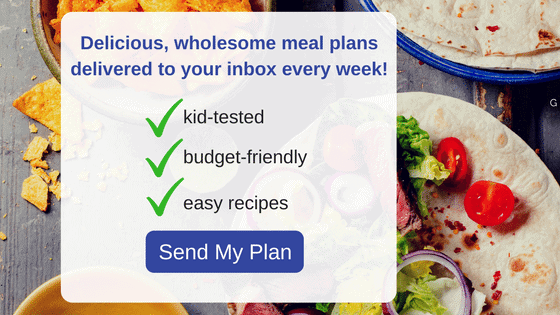 So glad you found this recipe to save you for the day (and hopefully come back to again and again!!) And good luck on your move!!! Looks delicious! This recipe, however, is not Whole 30 as it contains both maple syrup and vanilla extract (both not allowed on the Whole 30). I’m still going to give it a try! Yes, you are ABSOLUTELY correct, this recipe is NOT whole30. I need to update that ASAP. Maple Syrup is Paleo not Whole30 and I completely overlooked that on this post. SO sorry for misleading you. I used the milk you recommended and followed the recipe exactly, but my creamer was all curdled and wouldn’t get smooth. Jani, I am so sorry this happened. Did you shake up your coconut milk before making creamer? I am going to add to the post to blend it if needed. Sometimes when the temperature of the milk is too hot or too cold it can be harder to emulsifie. Just tried this today! So deliciously amazing! Thank you for sharing! Thank you Liz! I am so glad you enjoyed! Hi, just wondering what a “serving size” is for the nutritional facts. 1 tbsp? Hi Leila! I just updated to include in notes that the nutritional values are based on 2 tablespoons each. So, the first canned coconut milk I tried ever was GOD AWFUL. However, I would really like to try this recipe, are there any brands you would suggest to stay away from? I’m on a paleo diet for medical reasons, and I REALLY miss my vanilla coffee creamer. Hi Ani! I love Trader Joe’s Brand. I use the light canned coconut milk and it is by far my favorite. I have do not like the Thai brand or refrigerated coconut milks for this recipe. I hope you can find a brand you can enjoy!! I added 1/4 t. Xanthan gum and blended in Vitamix. Once you stir it in your coffee it stays mixed in a creamy. Next time I will try 1/8 t.
What a great tip! Thanks for sharing Dana! Sounds like a great recipe, but I cannot stand coconut milk. Would soymilk also work? It would work, it will not be as thick or creamy, but will certainly work as a great substitute.